Two episodes in, and I’m still not really sure what to make of Garo – Vanishing Line. Granted, we’re still really early into the series, but if the history of this franchise is anything to go by, I feel like we should’ve had a decent idea of the show’s core premise by now. Much like the premiere before it, this week’s episode felt less like it was focusing on the show as a whole, and more like it was interested in showing off one of its core characters. The character in question is named Luke, someone who I’d say is a nice if somewhat standard foil to the brash and overly impulsive “Sword”. A different kind of cool. Luke is your typical upright, careful, cautious and overly serious secondary character. If you’ve watched anime for a long time, you’ve probably seen something like him before. 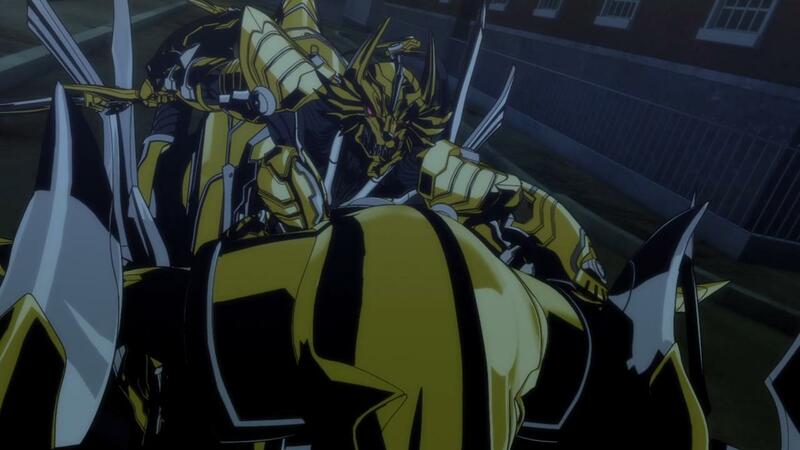 What’s interesting is that the original GARO, had a similar dynamic to the one we see here. The big twist though, was that the roles were primarily reversed. It was the serious, uptight character that had the primary protagonist role in Leon, with his dad German (pronounced Herman) serving as the foil and support. 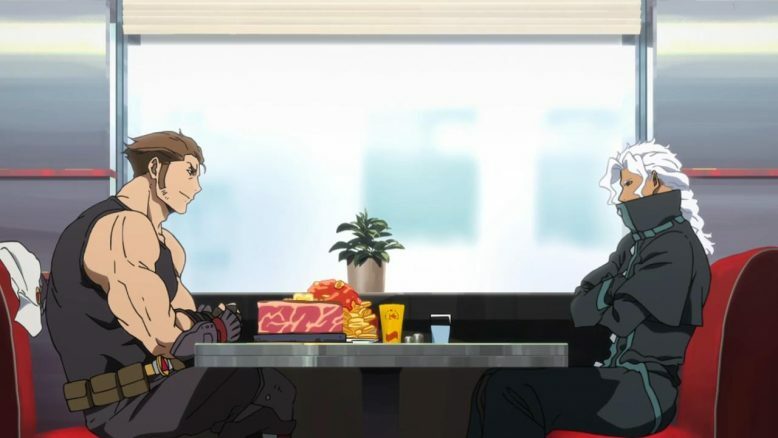 Of course, while its easy to liken the duo from Vanishing Line to the original, the dynamic and even the characters themselves, don’t really compare. Both Luke and Sword feel really superficial as characters, and its hard to really see a reason for the two to exist beside on another. They obviously don’t agree with each other, that much is clear in the episode itself. They also clearly work decently well together, because of how antithetic their ideologies and personalities are, but I don’t think there was much thought put into this pairing beyond the fact that they just work well together as characters. Two anime stereotypes walk into a diner. And that’s not the kind of depth you want from your central pair in a story. If anything, this whole pairing between Luke and Sword, actually ends up making Sword look a lot better than he seemed last week. 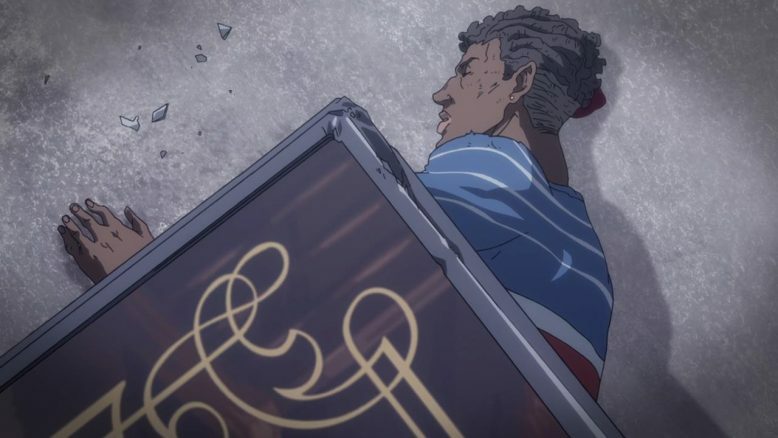 Rather than stick to the weird “cheesey but cool” image that we got last week, the show this week showed us a character that really moves and acts with his heart on his sleeve. Again, its nothing new, but it goes a long way towards making me (at the very least) like and root for Sword as a character. I really liked the line where he said “Someone who doesn’t understand people wouldn’t be able to save one”. This is a theme that we saw become the entire focus of the original Garo, from a thematic perspective at least, so its great to see this series’ protagonist embody that as a core value of his. And in the end, in this week’s “monster of the week” story, we have Sword himself actually lead the duo to the horror that both men are hunting. And its done through empathy no less. Not the guy I thought would be championing empathy. Speaking of the “Horror” of the week, I do have to say that I’m kind of surprised at the show still not really mentioning its core theme yet. The original Garo pretty much opened up with its larger conflict front and center. There was definitely a case of each episode having a sort of “monster of the week” story, but there was always a ongoing conflict that was driving the core story of the series forward. 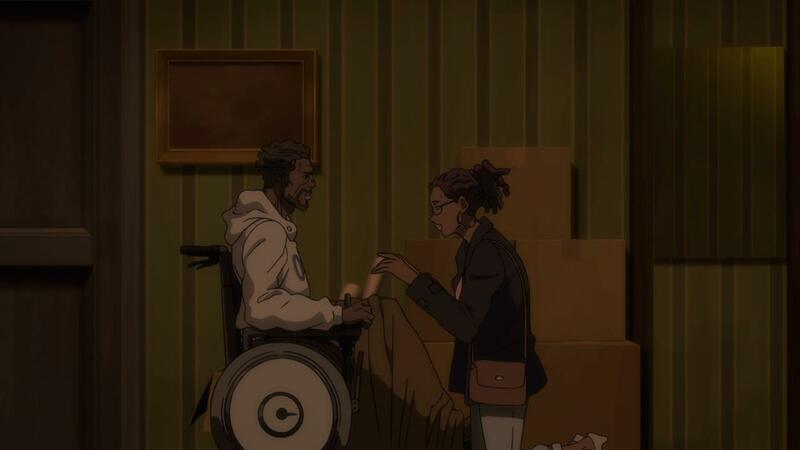 Garo Vanishing Line doesn’t have a core story, so all its left with, at least in its first two weeks, are those monster of the week stories. The Horror that we get to see this week, is an Olympic Gold Medalist, who’s lost the use of his legs due from an accident. What comes next is something that I’m sure Garo fans are fairly familiar with. The Athlete in question, Hardy, just can’t help but yearn for the good old days when he hadn’t lost his entire world. And Hardy’s tough life situation, makes him a prime target for a Horror to take him over. That’s really how Horrors work in the Garo franchise as a whole. They take a human who’s been weakened by tragedy and take advantage of that pain to basically posses that human. Once you become a Horror (and it always happens willingly) there’s no going back. You’re a monster, and its basically up to the Garo of that era to hunt down and take you out. Which is more or less what happens this week, and we see Sword basically track down Hardy through his worried girlfriend Enith, and then both Luke and Sword end up hunting the guy down. 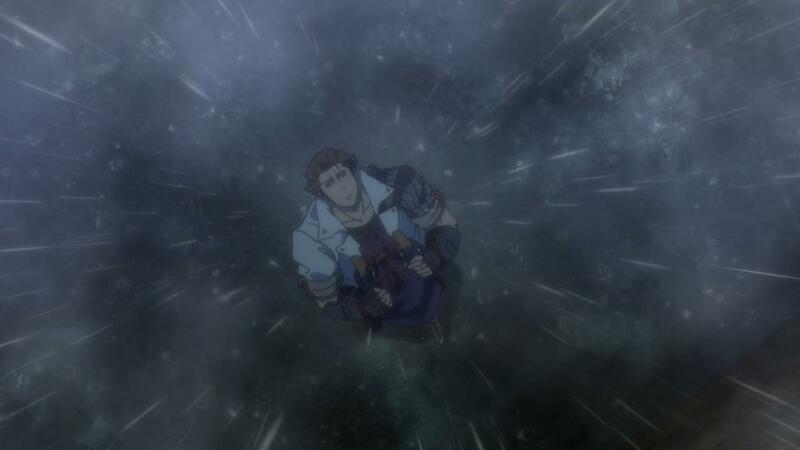 What’s worth noting is that, like any good Garo Horror origin story, there’s really an element of tragedy here. Hardy’s a really swell dude, and he loses his legs by actually sacrificing himself to save the woman he loves. The woman, Enith, at the time, is actually really angry with him and it seems obvious that she leaves him when this whole incident happens. But Hardy doesn’t care about how Enith dislikes his lack of vulnerability, he still dives forward and pushes her out of the way, selflessly. That little detail, makes Hardy’s transformation into a Horror, all the more heartbreaking. 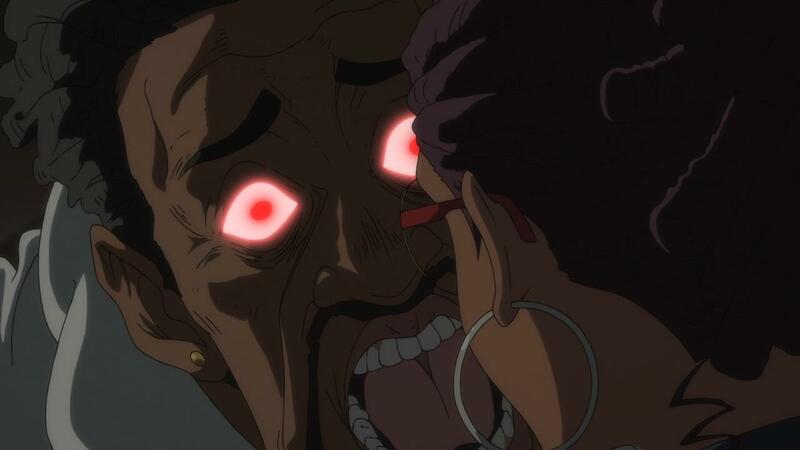 Now, having said that, I will say that there’s something a little bit less special about the Horror related stories we’ve seen from Garo Vanishing Line. Here’s the thing, most of the stories we’ll get from this series, are going to be set in contemporary times, and the issues therefore, will be contemporary in nature. And that makes everything a bit less inspired and almost boring, in my eyes. We’ve seen a ton of monster related anime do the whole “runner loses his legs and becomes a monster” story. What made the original Garo so interesting, is that the stories and issues it presented, were based off life in a fantasy version of Medievil Europe. The stories of people transforming into Horrors, therefore, had an element of world building and immersion to them, that Garo Vanishing Line just lacks. Hardy = Core Plot for the show. Sophie = Characters. A sword smith losing his son to war and then being driven made with grief, is I think, a lot more interesting than an Olympic Gold medalist wanting to run again. Sure, both stories have an emotional core to them, but one just seems fairly average, while the other gives us a look into the every day life of a different world and even time. Plus, as I mentioned earlier, the Horror transformation story is really all Garo has this week. Unlike Leon’s big story of revenge, we really don’t have anything all too big driving Sword and Luke, at least so far. Sophie, who I am assuming will play into the larger story, is still kind of off to the side, doing her own thing. We see her briefly as she literally runs into Hardy this week, but there’s not much progress on the story as a whole. The rain scenes are particularly beautiful. 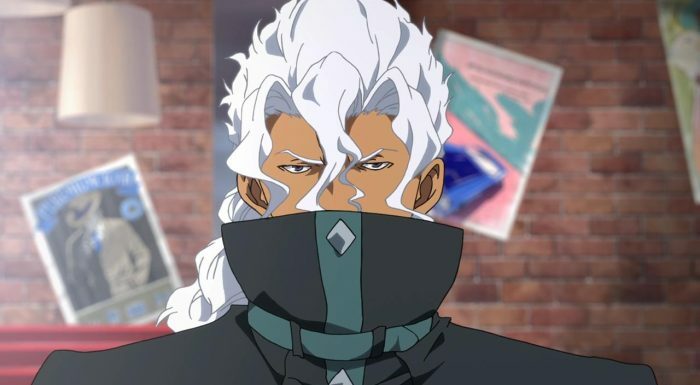 And it seems like we’ll be left waiting for at least another two weeks before we get into whatever larger story Garo Vanishing Line has planned. Next week’s episode, is titled Gina, and will likely focus on introducing the third character in the primary cast. 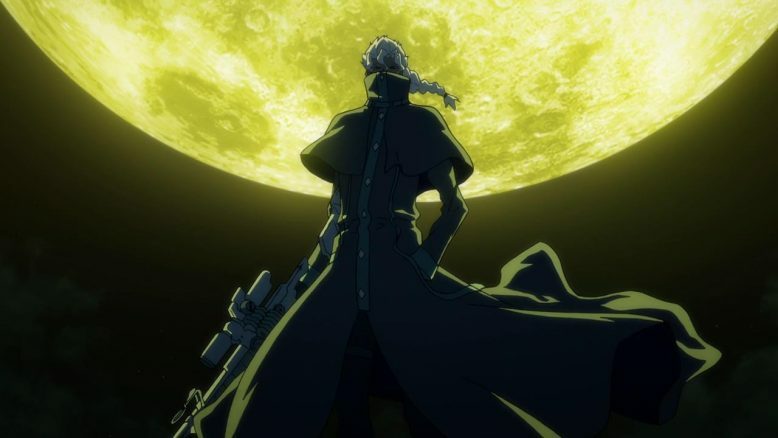 I remember that the original Garo had two warriors (the father son duo of German and Leon) and a very memorable third member of the trinity known as Emma (who was a Makai Alchemist). Is Gina going to be this series’ Emma? My instincts definitely say so. 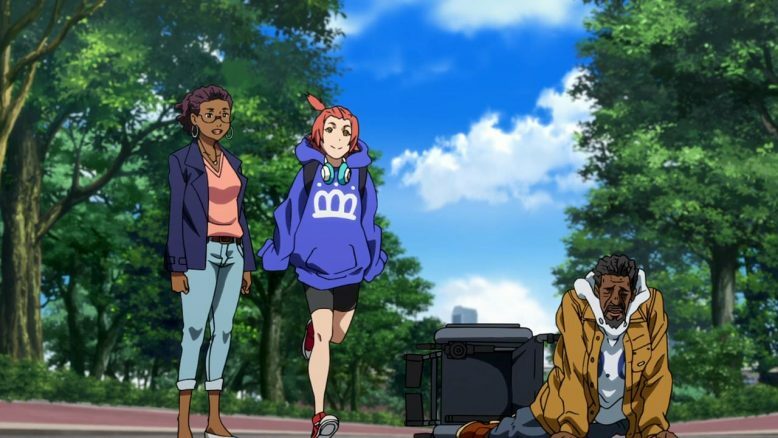 In any case, its still too early to really say if Garo Vanishing Line is a series that’s got a core good story. The core premise hasn’t been revealed yet, and the show is still just laying out its main characters. It’ll be interesting to see if there’s more to Garo Vanishing Line than the excellent visuals and production values. In case you forgot that this is a Garo show. 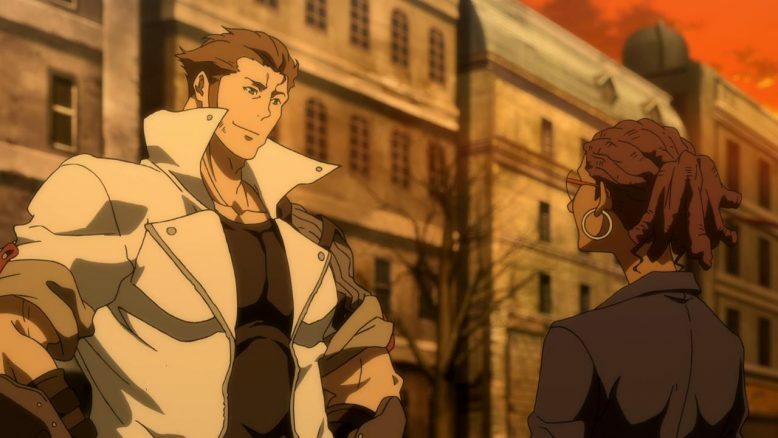 Its worth mentioning, even if in passing, that Garo Vanishing Line looks and feels amazing. Between this and Inuyashki this season, MAPPA is really cleaning house when it comes to good animation and anime series. Here’s hoping that the storytelling can keep pace with the excellent animation work.